We fabricate marble and granite and we also install ceramic and natural stone tile. We work within the residential arena as well as commercial interior and exterior projects. Please visit our portfolio page to view a wide range of our beautiful finished projects. We help our clients throughout every step of the process, from color selection, to seam placement. Whether you are the homeowner, designer or architect, every client receives our personal attention. Each project is truly a custom experience. Our investment in high-tech, state-of-the-art machines (ranging from digital templates to waterjets) gives our customers a high-quality product. We also utilize the environmentally friendly business practice of recycling and filtering water, used by our machines. Our water reclamation process not only cuts costs, it is reflective of our care and concern for the environment. Below is a list of the types of stone we offer. 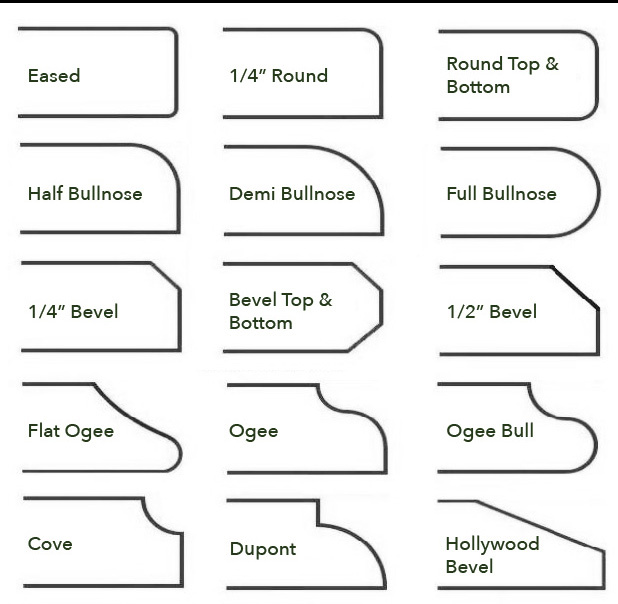 In addition, there is a variety of edge details available for you to choose from for your custom project. Let us know what questions you have and how we can help further accommodate your needs. With each home you build, you also build your reputation. Custom Stone is devoted to upholding your highest standards and representing you in a professional, positive manner. This is how we have built our reputation in the Triangle as a leader in the stone industry. Please contact us for a competitive quote. We take pride in providing all of our clients with “a tradition of timeless beauty”.